-Order's picked-up by the customer or on behalf of the customer assumes full responsibility for the material once it has left the nursery. All loads must be properly secured and tarped before departure. A list of necessary supplies can be discussed prior to arrival for ease of transportation. -All orders are COD, unless customer has been notified that credit is available. -An approved credit application must be on file prior to receiving any plant material. -All payments are due net 20 days from the date of the invoice. -Past due accounts are subject to a monthly service charge. -Orders dug out of the ground, and not pick up will be subject to a 50% of purchase price replanting fee. Shipping > Customers receiving nursery stock will be given no less than one days’ notice of the shipments arrival. Truck drivers may not be employees of Winding Creek Nursery and are therefore not required to assist in the unloading of nursery stock. Warranty > Winding Creek Nursery exercises the up most care to ensure the survival of your nursery stock. All stock is subject to proper handling, planting and care therefore no guarantees or warranties are either expressed or implied. We will however assist with any questions or concerns you may have concerning your stocks health and well-being. We would be glad to deliver your nursery stock to your door so you can enjoy the planting process. If time is short you can let us know where you would like your product planted and we will take care of the rest. Let us transfer your tree from one location to another. 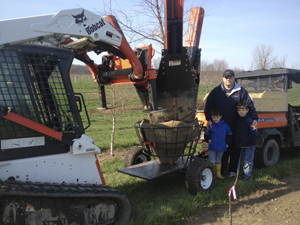 Our Bobcat and 36" tree spade can move a tree up to a 4" trunk size and can get into some very tight spots!. Give us a call and let us know what your project is and how we can help.